It's a fact that a lot of foreign travelers who traveled to Mainland Asia have skipped the Philippines. In the next coming weeks, visitph.net will list down the reasons why the Philippines was not on their list. Visitph.net will try to convince these travelers to pay a visit to the Philippines and discover the wonders of its 7,107 islands and experience the Filipino hospitality. 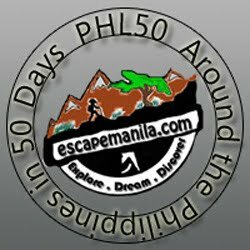 "I skipped the Philippines on my RTW trip because I was concerned that the cost of flights from mainland Asia, and between islands, would be too much. I've heard great things!" While this may be true few years ago, with the recently approved open sky policy, a lot of Asian airlines have extended their flight to the Philippines from the rest of Mainland Asia. As a result, airfare has become more competitive and a lot cheaper. There are almost all year round air promos offered by different budget airlines. To make sure that you get the cheapest rate, you must book ahead of time, at least a month from your trip. Back in 1999 he left home for a 3-month trip to Southeast Asia that has turned into 12 years of almost constant world travel. As a permanent nomad, it is his goal to educate himself first-hand about the world by focusing less on the sights and more on the human interactions and lessons learned along the way. "To be honest, the only reason I have not yet visited the Philippines is because I prefer to travel overland as much as possible. Very rarely will I fly in and out of one country and because the Philippines is a group of islands and not connected to any other country, I've yet to include it on any of my trips to SE Asia. However, the more I keep hearing about it, the more I do want to visit and so I have promised myself that on my next trip to SE Asia, I will indeed spend some time in the Philippines as well." This is actually the most popular reason why most tourists skipped the Philippines. When I was backpacking in Indochina, I met a lot of travelers and asked them if they actually have any plans of visiting the Philippines and they gave me the same answer as what Earl said. But then again, there are now a lot of budget airlines connecting the Philippines to the rest of Asia. Dan and Audrey are road warriors providing insightful stories, gorgeous culinary photography, and incredibly detailed accounts of their travels. "Main reason we haven't visited yet is time. It's a big country and we'd like to spend several months there. When we first began traveling in Southeast Asia, we only had 4-5 months in the region and stuck to the mainland. We've been through since then with a couple of months here and there, but without a large amount of time to spend there." They both plan to visit the Philippines soon. Audrey, thank you for your time in responding to my request. Yes, Philippines it's quite big and it will take a lot of your time to travel and discover its 7,107 Islands. One thing we assure you, the Filipino hospitality will make you love the Philippines more. Stephanie is a girl who can't sit still. She blogs about her adventures at Twenty-Something Travel. "To be honest the Philippines were never really on my radar for this particular trip. I was traveling on a pretty tight budget and the cost of flying to the Philippines never really factored into that. I really just stuck to mainland SE Asia and traveled overland- I never made it to Malaysia or Indonesia either." "I do hope I get the chance to go some day though, it seems like a pretty awesome place!" Caz and Craig are a couple of unorthodox Australians seeing the world on their own terms. "I've never really considered the Philippines before as I have not heard that much about it. We had heard so much about other SE Asian countries that we always chose to go there first." "We would really love to go to the Philippines and have been hearing a lot more about it lately which is definitely intriguing us to go." Posted in: Visitph Asks...,Why a lot of travelers skipped the Philippines on their Asian Trips?